But the oil-price crash was supposed to goose consumer spending. The price of oil continues to crash relentlessly. WTI trades at $49.80 as I’m writing this on Monday after hours, down 5.5% for the day, and down 54% since June 2014. The oil-price plunge is eating into the American oil boom, munching on income statements and balance sheets of drillers that have gorged on junk debt. It’s chewing up junk bonds and leveraged loans. It’s frying oil and gas stocks. It’s starting to wreak havoc among suppliers to the industry. Layoffs are starting to cascade across the oil patch, company by company, as capital expenditures and operating expenses get slashed in an effort to stay liquid long enough to make it through the oil bust. Oil busts are terrible creatures in oil and gas states, such as Texas, Oklahoma, or North Dakota. The last one persisted for a long time. It took down banks, housing, restaurants, oil-field equipment manufactures and their suppliers, grocery stores…. Pickup truck sales plummeted, boat sales dried up. Jewelry stores fell on hard times. This time, it’s different. Fracking is immensely capital intensive. Wall Street is up to its ears in it. Hedge funds and private equity firms will join banks in taking the hits on their equity stakes and on the debt they hold. But forget that. What we’re inundated with is the tsunami of benefits of lower oil prices. Airlines make extra billions by offering the same crummy service without lowering airfares, though their fuel costs drop. Utilities come out ahead for similar reasons. Toll road operators will be able to raise tolls and extract more money from drivers who’re sitting on what they’ve saved at the pump, according to Wells Fargo. It expects airports to shine, “specifically large international gateway airports with significant cargo operations.” Because consumers will buy more imported stuff with money they saved on gasoline. Alas, much of that gasoline is an entirely American-made product all along the chain, from the technology required to extract crude to the gallon of regular dispensed by a machine. Whatever money consumers save on gas lowers the consumer-spending component of GDP. If consumers spend all this money on something else, consumer spending stays flat. It just gets shifted around. But many people won’t spend the money on other things. That this equation doesn’t compute, though consumers like it, is clear [This Is Why the Oil-Price Crash Will Maul the US Economy]. And it’s starting to show up in the corporate numbers. Based on exuberant consumers, overjoyed by what they saved on gas, the Consumer Discretionary sector of the S&P 500 should be regaling investors with positive revenue and EPS guidance for Q4. But the opposite is happening. 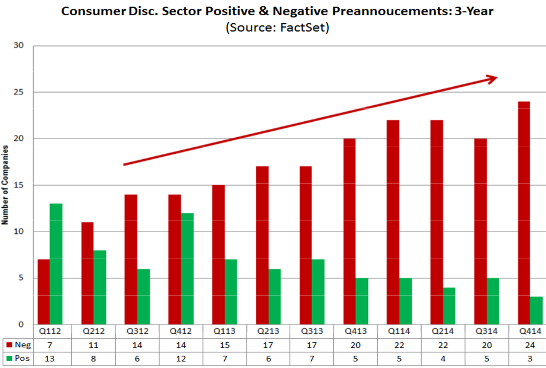 Of the Consumer Discretionary companies in the S&P 500 that have issued any guidance for Q4, 24 have issued negative EPS guidance, according to FactSet. That’s 89%! It’s the worst in the data series going back to 2006. It’s 73% above the 5-year average. Even during the Financial Crisis, it wasn’t this bad. However, the prior record of 22 wasn’t set during the Financial Crisis. It happened in Q1 and Q2 last year when polar vortices and a variety of other issues were blamed. Only 11% – or 3 companies – issued positive guidance, tied for worst place with Q1 2006, when the housing market was “plateauing.” Then there’s the nagging fact that 10 of these companies have issued negative revenue guidance, with only 1 company issuing positive revenue guidance. The Consumer Staples sector was even worse: of the 5 companies in the S&P 500 that issued guidance for Q4, all of them were negative. Quarter after quarter, negative guidance rose while positive guidance dropped. And in Q4, they’ve gotten completely out of whack, a quarter when the hoped-for boost provided by lower gasoline prices disappeared in a reality where consumers are being wrung dry by economic growth that is happening somewhere else, but not in their wallets. Of the 24 Consumer Discretionary companies in the S&P 500 that have issued negative EPS guidance, 13 are in retail, with Specialty Retail accounting for 8 of them. There are so many other factors, some good like the decline in unemployment rates or the anniversary of cuts in government programs, but some bad factors as well like the increase in part-time work or the lack of wage growth for low income workers. [….] So we really don’t know to what degree gas prices helped or to what degree they’ll help going forward. Lower fuel prices just couldn’t compensate for the other issues they were facing: 9 mentioned higher costs – vexing inflation that doesn’t officially exist; 8 blamed the strong dollar, though it would lower costs; 3 blamed sales, which is a hard thing to admit to, and 3 blamed the old standby, competition and higher promotional costs. Retail prices of gasoline have fallen by an average of $1.12 a gallon from a year ago, according to the EIA. And this is how it gooses consumer spending and cranks up the economy? Some sectors are making more money, such as airlines, because their costs are going down, not because consumers save so much money that they’re flying more. If consumers spend more overall, it will be for other reasons. And those other reasons, as the retailers have pointed out, might crumble in face of the numerous negatives consumers are still facing. But those would be the lucky ones, not in the oil and gas business, not living and working in the oil patch, where the oil-price collapse is beginning to cause all sorts of anxiety and pain. The oil-price collapse and financial engineering have coagulated into a toxic mix. This entry was posted in news and tagged central planning, currency wars, economic collapse, Fed, fed policy, federal reserve, Gold, gold manipulation, market manipulation, middle east, Oil, Oil Prices, PMC Ounce, russia, saudia arabia, shale oil, silver, US Dollar, wolf richter, wolf street on January 6, 2015 by Site Admin.